Hamilton East is a New Zealand parliamentary electorate. It is currently held by David Bennett MP of the National Party. Since the 1969 election, the number of electorates in the South Island was fixed at 25, with continued faster population growth in the North Island leading to an increase in the number of general electorates. There were 84 electorates for the 1969 election, and the 1972 electoral redistribution saw three additional general seats created for the North Island, bringing the total number of electorates to 87. Together with increased urbanisation in Christchurch and Nelson, the changes proved very disruptive to existing electorates. In the South Island, three electorates were abolished, and three electorates were newly created. 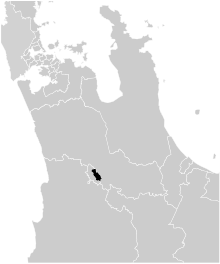 In the North Island, five electorates were abolished, two electorates were recreated, and six electorates were newly created (including Hamilton East). The earlier Hamilton electorate dates from 1922. In 1969 Hamilton West was split off; that electorate initially extended to the west coast. In 1972 the additional electorate of Hamilton East was created, and Hamilton was abolished. The electorate is mainly urban, and covers the eastern part of the city of Hamilton. The Waikato River divides the city in half and forms the boundary between the Hamilton East and Hamilton West electorates. Only one other electorate borders Hamilton East, the rural electorate of Waikato to the east. Hamilton East includes the suburbs of Rototuna, Flagstaff, Queenwood, Chedworth Park, Fairfield, Fairview Downs, Enderley, Claudelands, Hamilton East, Hillcrest, Silverdale and Riverlea. Hamilton East is home to the University of Waikato, and 11.3% of the electorate's workforce is employed in education and training, the second-highest proportion in the country. The majority of households are families, and the median family income is $NZ61,500, which is $2,500 higher than the national median. Nearly every party since 1972 that has won Hamilton East and its sister seat of Hamilton West has gone on to form the government, earning these seats a reputation as bellwether seats. One notable exception was in 1993, when Labour captured both Hamilton seats from National, but failed to win a parliamentary majority. In recent years, such as the 1999 and 2005 elections, Hamilton East has been won more often by a National candidate, despite the Labour Party forming the government. Unless otherwise stated, all MPs terms began and ended at general elections. Members of Parliament elected from party lists in elections where that person also unsuccessfully contested the Hamilton East electorate. Unless otherwise stated, all MPs terms began and ended at general elections. a United Future swing compared to results of United NZ and Future NZ, as the two merged in 2000. ^ McRobie 1989, p. 111. ^ a b McRobie 1989, p. 115. ^ McRobie 1989, pp. 112, 116. ^ McRobie 1989, pp. 111, 115. ^ McRobie 1989, pp. 83, 110, 114. ^ a b c "Hamilton East" (PDF). Parliamentary Library. March 2008. Retrieved 14 June 2010. ^ "Official Count Results -- Hamilton East (2017)". Electoral Commission. 7 October 2017. Retrieved 12 October 2017. ^ "Official Count Results – Hamilton East". Electoral Commission. 10 October 2014. Retrieved 17 October 2014. ^ "Enrolment statistics". Electoral Commission. 26 November 2011. Retrieved 17 December 2011. ^ "Electorate Candidate and Party Votes Recorded at Each Polling Place – Hamilton East, 1996" (PDF). Retrieved 13 July 2013. Wilson, James Oakley (1985) [First ed. published 1913]. New Zealand Parliamentary Record, 1840–1984 (4th ed.). Wellington: V.R. Ward, Govt. Printer. p. 266. OCLC 154283103. This page was last edited on 12 April 2019, at 05:14 (UTC).